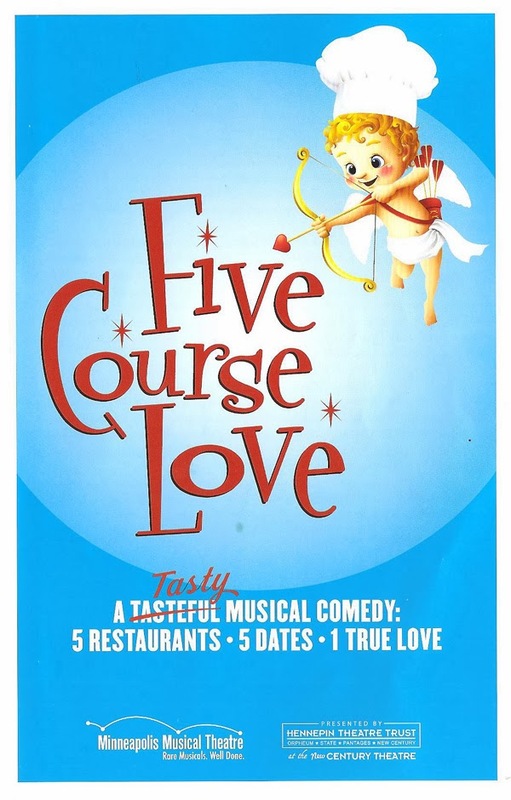 Minneapolis Musical Theatre's Five Course Love is billed as "a tasteful tasty musical comedy." This is truth in advertising - it's definitely not a tasteful show, with lots of raunchy, campy, over-the-top comedy, but it is quite tasty, with fantastically committed performances by the three-person cast and clever, funny, and occasionally lovely songs. The evening plays out as five different love stories set in five theme restaurants, with three actors playing a different character in every scene. Amanda Weis and Ryan McGuire Grimes are the couple in love (or something), and Joseph Pyfferoen is the waiter, although these characters take different forms in each scene. All three actors are excellent at a very difficult skill - singing for comedic effect while still sounding fantastic (the gold standard of this skill is of course Sara Ramirez as the Lady of the Lake in Spamalot). They do some pretty crazy things with their voices (accents and affectations), but they always sound great. The "love stories" include a blind date, an affair, a love triangle, and unrequited love. They're played to pretty broad effect, some funny, some sweet, and some just plain ridiculous. The music follows the style of the restaurant, from Country-Western to Italian to German to Mexican to '50s. It's equal opportunity offensive comedy, as all ethnicities are exaggerated and made fun of. But the commitment of the actors makes it work as they play it for camp, and the songs for the most part are catchy and clever. My favorite are the catchy '50s-themed diner songs (with shades of Grease), the lovely and melancholy "The Blue Flame," and the show opener and closer "A Very Single Man" and "Love Looking Back at Me," as things come full circle. The set (by Darren Hensel) looks like a Valentine's Day card exploded. Five doors open to reveal the name of the five restaurants in which the scenes take place. The quick-change costumes (by Joshua Stevens) help the actors and the audience differentiate the characters, so that you almost forget it's the same actors in every scene. The three-piece band keeps things moving along. The thrill of three incredible actors running you through a mine-field of love as quickly as they possibly can. And love would be good, it would be good if they took love away from it all. And maybe if they were humming something from the show as they went off into the night. That would be icing on the cake. Mission accomplished on #1 and #3, #2 not so much, but it's definitely an entertaining ride and I went off into the cold night humming. And sometimes that's enough. Minneapolis Musical Theatre's Five Course Love runs through Valentine's Day weekend at the New Century Theatre. Coming up next for MMT is the most anticipated (by me) show of their season - the very funny political satire as emo-rock musical, Bloody Bloody Andrew Jackson. I'll definitely be returning to the New Century this summer for some "Populism, Yea, Yea!"